Around the world, governments are constantly facing new demands, greater expectations, and an increasingly more vociferous and assertive citizenry calling for better governance. In such a scenario, governments can ill-afford to ignore such demands and expectations. The current challenges faced by governments, for example in Europe, the United States, and the Middle East, represent a complex mix of political, legal, social, and economic issues. These are increasingly not limited to national boundaries, and the underlying inter-linkages cannot be overstated. This confluence of demands, expectations, challenges, and trends require governments to be connected in the broadest and deepest sense. The traditional governments operating in relative isolation and projecting an image of infallibility are rapidly being replaced by governments that are more networked, responsive, collaborative, and participative. Co-creation of services leading to co-production of government is the new paradigm. This transition requires fundamental change in current mental models, supported by a structured and disciplined approach to conceive and design the connected government. Taking a whole-of-government perspective is a critical success factor. It is imperative to think strategically to elevate the role of enterprise architecture. This chapter identifies the key dimensions of connected government, presents their distinctive attributes, explores the powerful, but, in some cases, controversial, concepts of connected government, and by embracing a systemic approach, investigates the criticality of enterprise architecture in powering connected government. 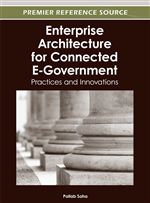 The foundational ideas in this chapter lay out a broad framework for understanding and benefiting from enterprise architecture, actualized via the edifice of connected government. Enterprise Architecture (EA) is the inherent design and management approach essential for organizational coherence leading to alignment, agility, and assurance (Doucet, et al., 2009). EA is often used to plan and implement efficient and effective transformation efforts. However, the strongest driver for EA is to improve service delivery and overall performance within the organization's business segments. The principal challenge faced by chief architects today is to institute an EA program that is able to coordinate sustainable changes throughout the enterprise, while simultaneously mentoring the specific transformation planning that is needed to support the mission (Saha, 2007). In a nutshell, EA is a robust planning function which helps organizations understand the process by which business strategies turn into operational reality. Hence, establishing a standard methodology for conducting architecture planning and implementation is vital. Metaphorically, an EA is to an organization’s strategy and operations as a set of blueprints is to a city and its buildings. Traditionally, by following an architecture-based approach, organizations strive to address issues pertaining to: (1) business alignment; (2) information accuracy and integrity; (3) infrastructure management; (4) security; (5) technology compatibility; (6) business value of IT; (7) enterprise governance; (8) business collaboration; and (9) procurement among several others. Though EA is often assumed to follow an organization’s strategy and to enable alignment of IT with business objectives, increasingly, evidence of the reverse is also surfacing. In other words, organizational strategies are being influenced by IT capabilities (Saha, 2007, 2008). Policy and strategy architecture, which establishes principles, rules and guidelines aimed at providing direction to the entire enterprise. Technical architecture, which defines the technology environment and infrastructure in which all IT systems operate. The above five domains largely represent the current state of practice in the discipline of EA. In their book, Coherency Management: Architecting the Enterprise for Alignment, Agility, and Assurance, authors Doucet, Gotze, Saha, and Bernard present and discuss the extended and embedded modes of EA in addition to the traditional mode. They assert that as organizations start embracing the more advanced extended and embedded modes, the need for synergy and consistency amplifies, thus facilitating the attainment of organizational coherence, the ultimate goal of EA (Doucet, et al., 2009). Successful EA not only captures the above five (5) domains, but also the relationships between them. Having linkages between the five (5) domains provide line-of-sight (or traceability) to the relevant stakeholders of the EA. Figure 1 depicts the key domains of EA, with special focus on government EA.